A challenging variation on the traditional game of Noughts and Crosses or Tic Tac Toe’. 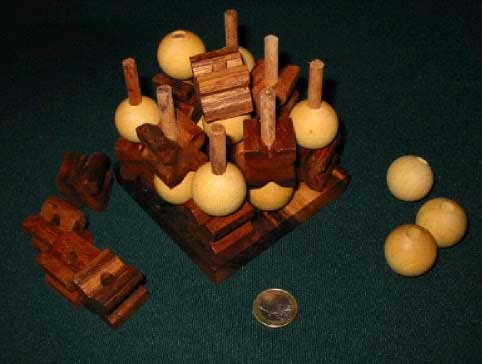 In this 3D version the winner must get three of their pieces in a row, horizontally, vertically or diagonally in any of the 3 possible directions before their opponent. For 2 players aged 6 years - adult. Base with pins and pieces ( No lid). Instructions included. Wood type -: Samanea. Packaging -: Transparent PVC. Dimensions. 105 x 105 x 90 mm. Weight.300 grams.